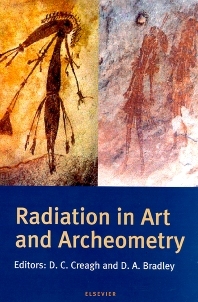 This book contains twenty chapters covering a wide range of research in the fields of scientific conservation of art and archaeometry. The common thread is the use of radiation in these analyses. The term "radiation" is used in the widest possible sense. The book encompasses the use of electromagnetic radiation in its microwave, infrared, visible, ultraviolet, x ray and &ggr; ray forms and the use of particulate forms such as electrons, neutrons and charged particles for which the Planck's Law relation applies. In many cases there is an interplay between the two forms: for example, proton induced x ray emission (PIXE), secondary ion mass spectrometry (SIMS). As far as possible the chapters have been arranged in order of ascending particle energy. Thus it commences with the use of microwaves and finishes with the use of &ggr; rays. The authors were chosen on the basis of their expertise as practitioners of their particular field of study. This means that, for example, the mature fields of study such as the IR and UV study of paintings have been written by senior researchers, whereas for the emerging fields of synchrotron and neutron techniques the chapters have been written by talented researchers at the commencement of their careers. /inca/publications/misc/creaghpr.htmPreface. The use of ground-penetrating radar in archaeology (L.B. Conyers). Electrochemical impedance methods in the conservation of metals (P. Letardi). The infrared examination of paintings (F. Mairinger). The ultraviolet and fluorescence study of paintings and manuscripts (F. Mairinger). Raman microscopy: a useful tool for the archaeometric analysis of pigments (V. Atieno-Alego). Thermoluminescence dating (L. Mulílek, M. Kubelík). Synchrotron radiation tomographic energy-dispersive diffraction imaging (S.L. Colston, A.C. Jupe, P. Barnes). The use of X-ray techniques for bone densitometry in archaeological skeletons (M.J. Farquharson, M. Brickley). The role of SIMS in understanding ancient materials (A. Adriaens). Scanning electron microscopy techniques for imaging materials from paintings (A. Burnstock, C. Jones). Transmission electron microscopy and its use for the study of paints and pigments (S. Bulcock). Radiocarbon dating in archaeology: methods and applications (T.Higham, F. Petchey). X-ray fluorescence applications for the study and conservation of cultural heritage (M. Ferretti). A synchrotron X-ray diffraction study of Egyptian cosmetics (P. Martinetto et al.). Attribution of antique Chinese blue-and-white porcelains using Energy Dispersive X-ray Fluorescence (EDXRF) (K.N. Yu). Neutron and synchrotron radiation studies of archaeological objects (W. Kockelmann et al.). The study of the characterisation and provenance of coins and other metalwork using XRF, PIXE and activation analysis (M.F. Guerra). The use of Mössbauer spectroscopy in studies of archaeological ceramics (U. Wagner et al.). AMS dating in archaeology, history and art (C. Tuniz, U. Zoppi, M. Barbetti). Author index. Subject index.